The Roomba® 595 Pet vacuums carpets and hard floors on its own, when you want it to. Roomba 595 Pet is designed with pet owners in mind featuring AeroVac™Technology, improved brush design for better hair pickup, and additional accessories. Using its patented 3-stage cleaning system, Roomba removes dirt, dust and debris while automatically adjusting to clean carpets, hardwood, tile and linoleum floors as it moves through your home. Its new simplified brush design utlizes innovative composition and technology for easier, stree-free maintenance. Roomba features iAdapt™ Responsive Cleaning Technology, an advanced system of software and sensors that allows the robot to vacuum more of your room more thoroughly. Roomba's Dirt Detect™ Technology finds the dirtiest areas in your house and spends more time cleaning them. 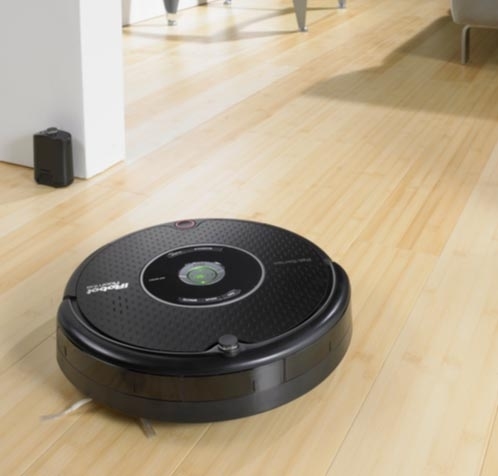 Roomba vacuums the way you would—thoroughly and efficiently. 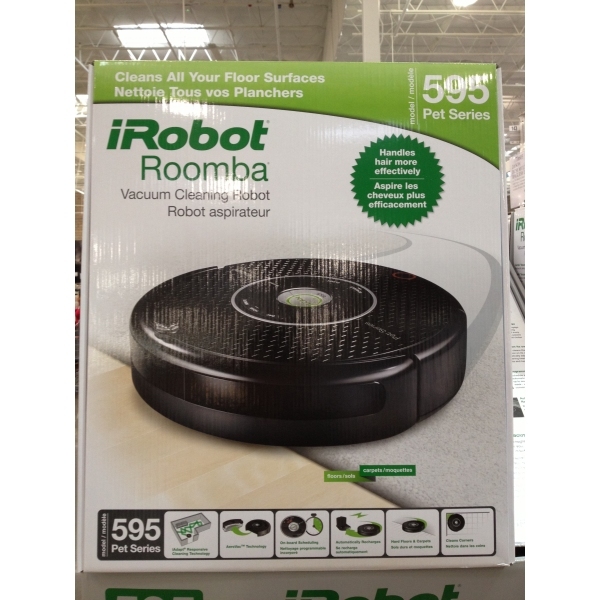 Roomba 595 Pet utilizes AeroVac™ technology to maximize air flow through Roomba's cleaning head to pull hair and debris off the brushes and into the bin evenly. Roomba 595 Pet can be easily scheduled to clean whenever and wherever you want—up to seven times per week. The included Virtual Walls® confine the robot to the areas you want it to clean and out of the ones you don't. iAdapt™ is Roomba's advanced system of software and sensors that allow it to clean more of your room, more thoroughly, getting into areas you can't easily reach. In fact, Roomba uses dozens of robotic behaviors and makes more than 60 decisions per second to ensure that it vacuums every section of your room, making multiple passes over the same area and focusing extra effort where the floor most needs to be cleaned (just like you would if you were vacuuming!). 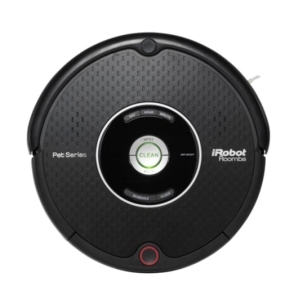 Roomba picks up an amazing amount of dirt, pet hair and other debris with its patented 3-stage cleaning system. A spinning side brush cleans along wall edges, counter-rotating brushes act like a dustpan and broom and the AeroVac™ bin maximizes air flow through Roomba's cleaning head to pull pet hair and debris off the brushes and into the bin evenly. iRobot's Compact Home Base charges Roomba while it is not in use. 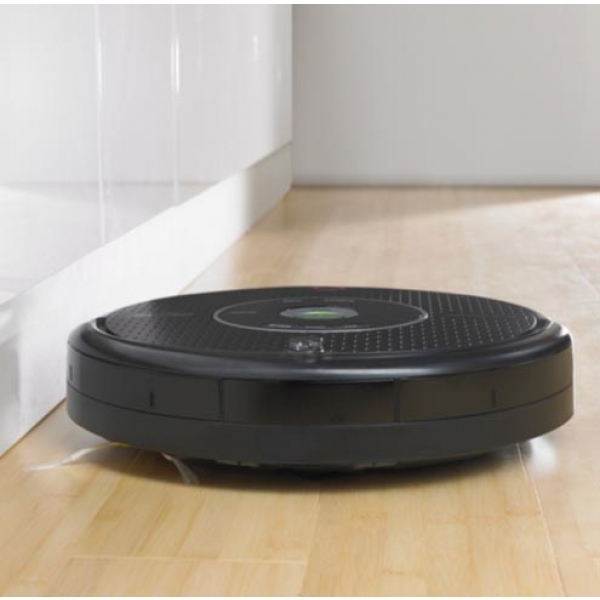 Roomba automatically returns its Home Base after it cleans the room or when the battery runs low. Either way you can find Roomba on its Home Base the next time you need it to clean. To support and encourage the development of robot technology, iRobot offers comprehensive resources for third-party developers, providing information and products that facilitate the creation and easy integration of new payloads, behaviors and capabilities on iRobot platforms. iRobot collaborates with external developers from government agencies, academic institutions and small and large businesses to create and bring to market innovations that help warfighters and public safety professionals tackle dangerous missions with less risk. iRobot's Research Group performs cutting-edge research to meet the advanced needs of sponsors with integrated robotic solutions. The Research Group pursues R&D opportunities with leading academic research institutions, businesses and other technology innovators, leveraging experience as a systems integrator and putting together best-in-class teams of partners from a wide range of technology areas. SPARK (Starter Programs for the Advancement of Robotics Knowledge) is iRobot's unique and multi-faceted educational outreach initiative. Designed to inspire students to choose careers in the robot industry and become the roboticists of tomorrow, SPARK helps teach science, technology, engineering and math in fun and interesting new ways. SPARK brings the exciting and educational world of robots into the classroom all year long with online resources, educator workshops, classroom visits and much more. In addition, the iRobot® Create® programmable mobile robot provides educators, students and developers with an affordable, pre-assembled platform for hands-on programming and development. As founding co-sponsor of National Robotics Week, iRobot actively promotes robotics as a pillar of 21-century American innovation and emphasizes its ability to inspire technology education. With two decades of leadership in the robot industry, iRobot remains committed to providing platforms for invention and discovery, developing key partnerships to foster technological exploration and building robots that improve the quality of life and safety standards worldwide. iRobot's home robots are revolutionizing the way people clean – inside and out. More than 6 million home robots have been sold worldwide. 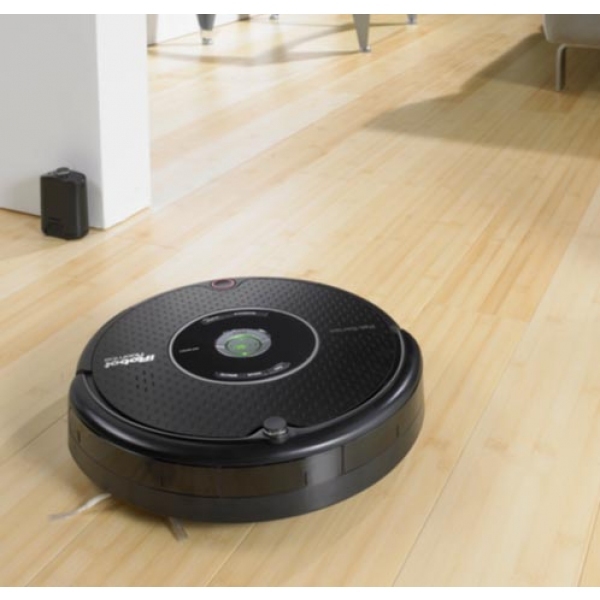 The award-winning iRobot® Roomba® floor vacuuming robot is leading the charge. Roomba made practical robots a reality for the first time and showed the world that robots are here to stay. iRobot's combat-proven government and industrial robots perform multiple missions – on the land and in the sea. More than 3,500 have been delivered to military and civil defense forces worldwide. As a key partner in the U.S. Army's modernization program, iRobot has developed the SUGV (Small Unmanned Ground Vehicle), a robot for dismounted mobile operations and infantry missions. SUGV's predecessor, the iRobot® PackBot®, is one of the most successful battle-tested robots in the world, performing thousands of dangerous search, reconnaissance and bomb-disposal missions while keeping troops out of harm's way. iRobot's line of government and industrial robots also includes the iRobot® Negotiator®, a surveillance robot for public safety professionals, and the iRobot® Warrior®, a large robot that carries heavy payloads. Seaglider™ and Ranger, iRobot's Unmanned Underwater Vehicles (UUVs), perform a variety of missions for maritime researchers and military planners. The Roomba® 595 Pet does the vacuuming for you. Using its patented three-stage cleaning system, Roomba removes dirt, pet hair and much more while automatically adjusting to clean carpets, hardwood, tile and linoleum floors as it moves through your home. 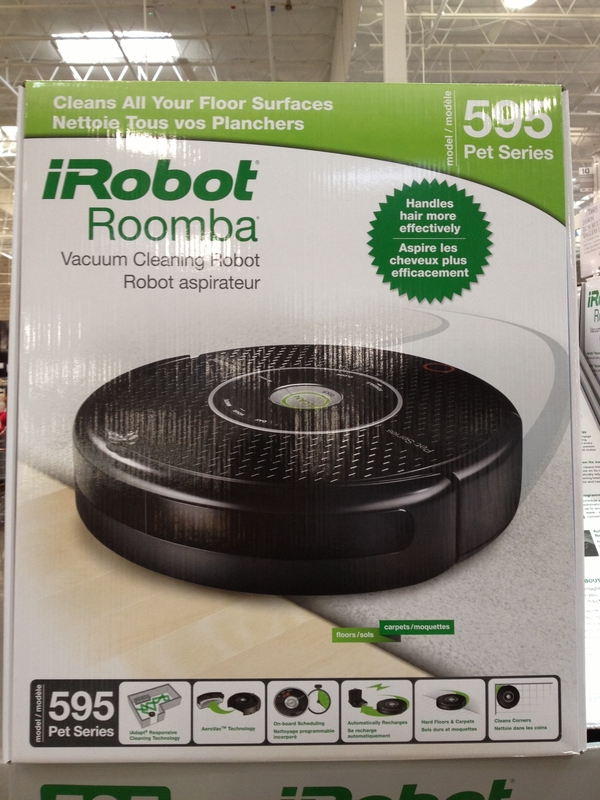 The Roomba 595 Pet utilizes AeroVac™ technology to maximize air flow through its cleaning head, pulling hair and debris off the brushes and evenly into the bin. The new simplified brush design utilizes innovative composition and technology for easier, stress-free maintenance. iRobot’s iAdapt® Responsive Cleaning Technology, an advanced system of software and sensors, allows the Roomba 595 to respond to and engage with your home environment so it can vacuum more of your room more thoroughly. Roomba vacuums every section of your room multiple times, getting into areas you can’t easily reach, including under furniture and around everyday obstacles, vacuuming until the job is complete. The Roomba 595 can be easily scheduled to clean whenever you want—up to seven times per week. The included Virtual Walls® confine the robot to specific rooms and areas so it cleans only where you want. 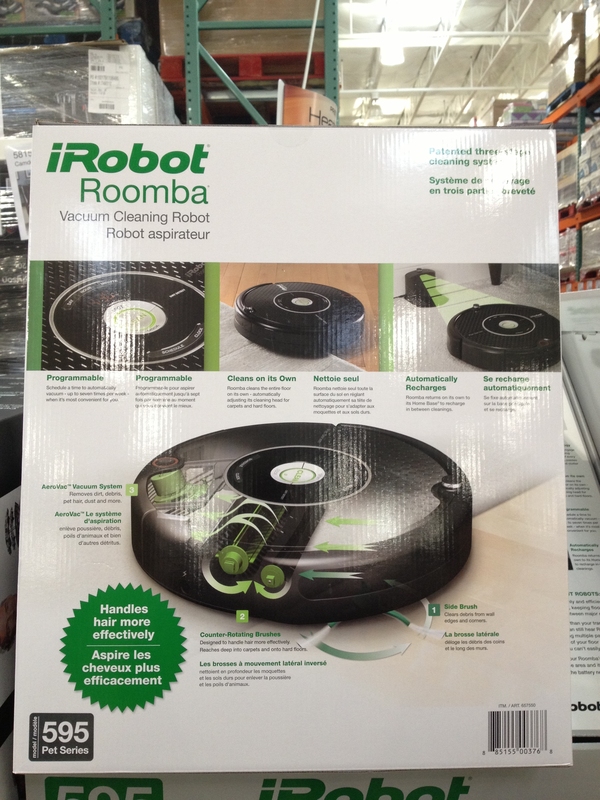 Once Roomba has finished cleaning, it automatically returns to its Home Base® to dock and recharge between cycles. All you need to do is press “Clean” and let the robot do the work. The Roomba 595 Pet delivers an enhanced value to pet owners; everything you need to maintain Roomba is already in the box including extra AeroVac™ filters, brushes and cleaning tools. 3-Stage Cleaning with AeroVac™ – Roomba 595 picks up an amazing amount of dirt, pet hair and other debris with its patented 3-stage cleaning system. A spinning side brush cleans along wall edges, counter-rotating reach deep into carpet and floor surfaces to pick-up debris, while a powerful AeroVac™ vacuum pulls dirt, hair, and debris off the brushes and into the back of the bin. Dirt Detect™ – Dirt Detect technology automatically senses dirtier areas and spends more time cleaning them. iAdapt® Responsive Cleaning Technology – iAdapt is iRobot’s advanced system of software and sensors that allows Roomba to clean more of your room, more thoroughly. 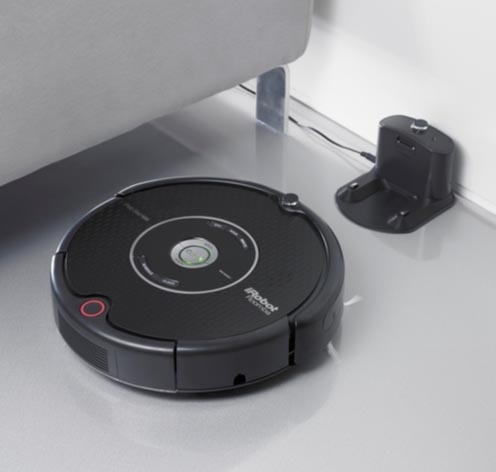 It ensures Roomba vacuums every section of your room multiple times, cleaning areas you can’t easily reach including under furniture, around everyday obstacles, and along walls. It even avoids stairs and drop-offs, navigates past soft barriers such as couch skirts, recognizes cords and carpet fringe, and self adjusts to clean hardwood, carpet, and linoleum. Virtual Walls® – The included Virtual Walls keeps Roomba cleaning where you need it and block off-limit areas. 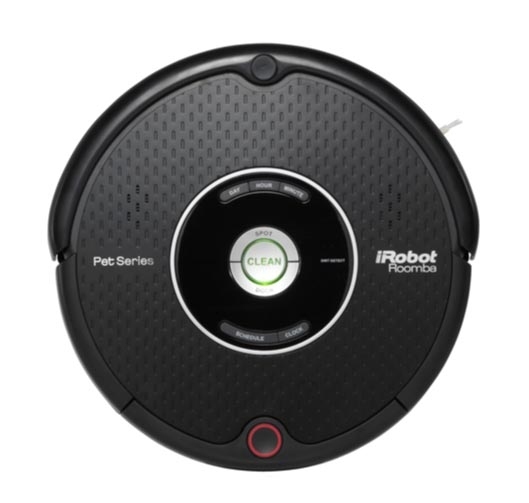 Additional Accessories – Ideal for pet owners, Roomba 595 comes packed with everything you need to maintain the robot including additional brushes, filters, and cleaning tools. 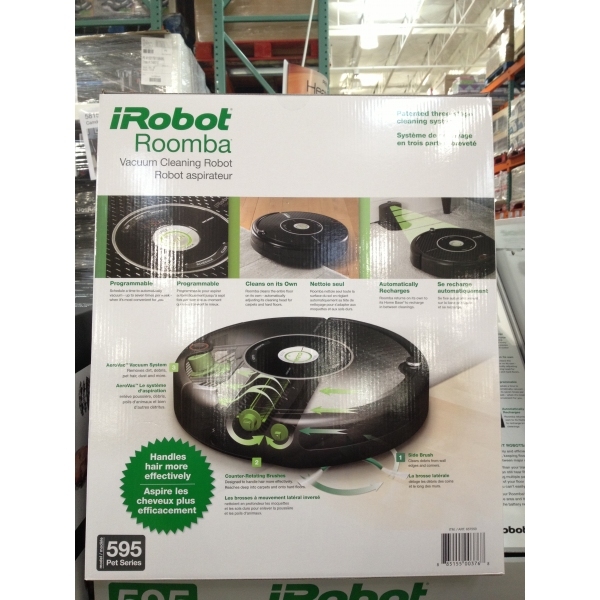 The iRobot® limited warranty shall not apply to failures or problems which are caused by products or equipment not authorized by iRobot Corporation.